Gorgeous Colonial Silver Co. Quadruple Silverplate Creamer & Sugar Bowl Tea Completer Set in an Art Nouveau design and style. Beaded trim along the edge, applied Art Nouveau flowers and leaves on the front in a full design, a complimentary, but less elaborate design on the back. The quadruple silverplate creamer is in extremely good exterior condition, with only one tiny spot on the bottom as shown in the photo. The inside, however, does have a moderate amount of discoloration. Also noted that along one side of the silver creamer, the beaded edge is very slightly out of shape. The silverplate on the exterior of the creamer, and along the handle, is in extremely good original silverplate condition. The quadruple silverplate open sugar bowl is also in extremely good exterior condition, with one small spot on the side - as shown in the photo. The inside of this silver sugar bowl, however, does show a moderate amount of discoloration. The silverplate on the exterior of the sugar bowl, and along the handles, is in extremely good original silverplate condition. These silverplate holloware pieces have their original thick quadruple silverplate; they have not been re-silvered. The silver plate creamer measures 3.5" high, 5" from tip of spout to tip of handle and weighs 8.2 ounces. The matching silver plate sugar bowl measures 3.5" tall, 6" between the tips of the handles and weighs 9.4 ounces. Touchmarked on the base with COLONIAL SILVER CO., Portland, QUADRUPLE PLATE, and the pattern number 1076. 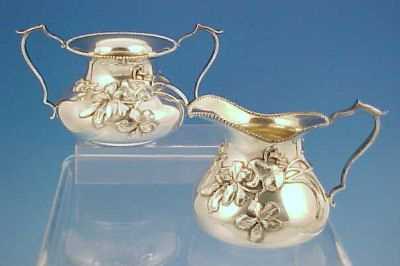 You can read more about the history of Colonial Silver from our Silver Manufacturers pages.